On the way to the departure lounge at Cape Town Airport you pass this advertisement for inward investment. It specifically refers to the number of direct international flights connecting the city with the rest of Africa and the rest of the world. This advert is just one very public demonstration of the focus of Cape Town Air Access, the multi-stakeholder team which is achieving considerable success in attracting new air services. It is a collaboration between the Western Cape Provincial Government, the City of Cape Town, Airports Company South Africa, Cape Town Tourism, Wesgro, and selected private sector partners. Unusually, the initiative is being led by the Tourism, Trade and Investment Promotion Agency for Cape Town and the Western Cape, rather than the airport. As delegates at Avia Dev, Africa’s Aviation Development conference, heard last week, the partnership started three years ago with a target of winning 3 new air services, but has far exceeded hopes and expectations, especially with international air services. Data from OAG shows that the number of international frequencies has grown by 21-22% each year for 3 consecutive 12-month periods, so that the number of international flights is almost double the number three years ago. One of the most recent additions is the four time a week RwandAir operation from Kigali to Cape Town via Harare, which started on 18 May 2018. One of the new routes, Victoria Falls, now has as many flights from Cape Town as London Heathrow, albeit on much smaller aircraft. This is a classic case of good route development practice being rewarded with new air services. Located as it is on the southern tip of the African continent, there is not much scope for connecting traffic. In fact, the proportion of traffic connecting at Cape Town in a recent month was less than 2%, according to OAG. This means that virtually all the new traffic comes from a combination of pent-up demand for travel to and from the city or has been stimulated by the availability of new air services. 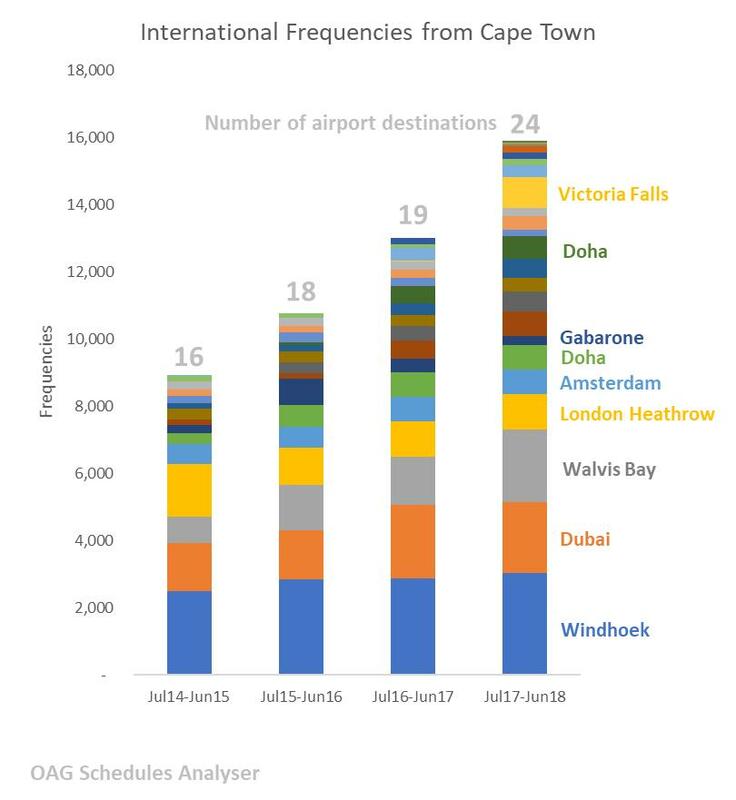 A clear sign of the potential was in the fact that almost three-quarters of all international traffic flew via another airport to reach Cape Town, with almost a third of passengers connecting at Johannesburg. Interestingly, the new services have not made much of a dent in connecting traffic; in March this year a hefty 71% of all international passengers were still connecting at another airport. However, it does appear that there is an impact at Johannesburg which handled 32,000 passengers connecting from Cape Town in March, of 23% of the total, compared to 37,000 in March 2015, which was 31% of all connecting passengers at Cape Town. All air service development courses address the need to work with stakeholders. The Cape Town Air Access initiative looks as if it might be on the way to becoming the classic text book example, and encouraging practitioners to ask just how much market stimulation is possible when there is real focus on the task at hand.